This program is a system-wide typing automation and speed-up tool. 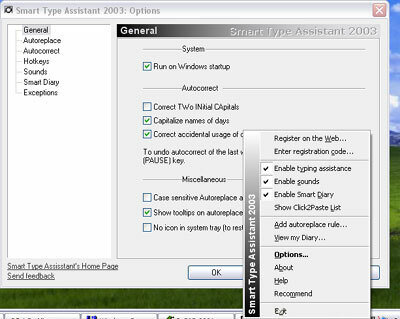 It includes abbreviations expanding, mistype corrections, correction of the aCCIDENTAL Caps Lock using, correction of TWo INitial CApitals, first letter of sentences, names of days; pasting large text fragments with one mouse click, extended Clipboard (Clipboard history), useful hotkeys, automatic Diary, ICQ-like system-wide keyboard scoring. Make your keyboard as smart as you!